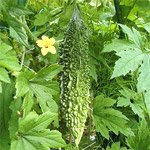 Bittergourd has excellent medicinal virtue and has the ability to reduce diabetes. Bittergourd being rich in all the essential vitamins and minerals esp vitamin A.B1,B2, C and iron. It happens to be another one of my favorite dish as well as my hubby.In Singapore the Malays uses carrots and eggs are add to reduce the bitterness of the vegetable and it also taste good. Today I'm prepare normal bittergourd fry which is my in law's recipe which she used to prepare in India for my hubby. Marinate the bittergourd slices with,turmeric,garam masala chillie,salt and curd for 2hrs. Coat a non-stick pan with 3tbsp oil and fry the bittergourd slices till they become soft and tender. Remove from pan and keep aside. In the same pan add another 2tbsp oil-add the mustard seeds. Once it starts to crack add the cumin,dried chilies and sliced onions with tomato and chillie paste. Let the onions cook well in the spice and turns slightly brown. Then add the bittergourd slices. Adjust the level of salt and once the oils starts to separate remove from flame. Serve with steaming white rice or any variety rice like lemon or curd rice. I tried this recipe.It came out well.In cooking most of the time,I wont get anything coming out well even after following recipes.But this was too gud.Thank you. U r keeping on posting various mouth watering recipes.Keep it up!! One more thing.If u wish/like to give/share ur recipes to a bigger audience by typing in tamil U can do it in arusuvai.com too.I follow that site also for recipes and since its in Tamil almost many of the members r ladies.Just a suggestion if u want to. Having ur own blog is always the best but still u can consider.